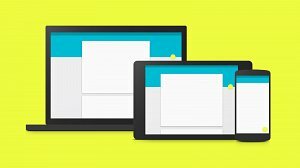 > Blog > Google Material Design: The End Of Creative Web Design? By now we should all know what Google Material Design is. If you use any number of apps by Google, such as Google Now, then you are most definitely aware of the new style. If by any chance you've been living under a rock for past couple of months, refer to the image in this post to get an idea of what I'm talking about. Just so there isn't any confusion, I'm referring to the use of material design in respect to web design and not android applications. Anyway, it's time to explain why Google Material Design is the end of the creative web designer. I want to start off by saying I'm not here to talk bad about the style. In fact, I love material design. I think it's one of the most revolutionary styles in web design since the creation of Bootstap. The use of shadows to create depth, motion to give users a sense of direction, and the way transitions visually grab users attention and direct them is amazing. One of the things that I find to be a stroke of genius by the guy's at Google is that along with the style comes a set of "Do's and Don'ts". This is extremely helpful for designers because it doesn't leave gray area for misinterpretation. The list of things that I hate about Material Design is a long list that would probably put most people to sleep. Because you're probably already fighting back yawns from reading this, I will try to make this short and sweet. 2. If you use it on your site, nothing about it can or will be original. Part of what makes awesome websites awesome is their ability to be original. The only people that can use this design and still remain original is Google. 3. It's simplicity makes me fear that people will use it as it is instead of taking some of it's design elements and implementing it into their sites and improving upon it. If used correctly, I think aspects and elements of material design can be used to create amazing web sites and amazing UI's. One of the more popular elements like the "Card" is something that I think many people should take advantage of. However, to completely mimic the style (which I have seen many people do) is going to destroy the creative genius that is the web designer. Hello There. I found your blog using msn. This is a really well written article.I'll be sure to bookmark it and return to read more of your useful information. Thanks for the post.I will definitely return. Here’s my take on it: Material Design is a weird, pastel, post-capitalist version of Brutalism. I came here from a goodle search of “I hate material design”, because that is how I feel. I, like some others, want to roll back my apps to a pre-MD version (speaking as an android phone owner here). I find it soul destroying. Google suggests designers copy the aesthetic of road signs. Really? REALLY? @North Dakota I know what you mean. I think there are a lot of people that don’t like material design. Unfortunately, I think there are just as many if not more people that do like it. Looks like we just have to live with it until Google moves on to something else. That’s funny that you found my post by searching that lol.